The Washington District of NS's Piedmont Division, the former main line of the Southern Railway, connects Alexandria and Lynchburg. Over much of its course the line runs through the rolling hills and rivers of the Virginia Piedmont. There are long bridges at Remington, Rapidan, South Rivanna River and Tye River. The terrain becomes more rugged south of Charlottesville. Coming into Lynchburg from the north, the line crosses the James River trestle and enters the Rivermont tunnel before reaching Kemper St. Station. 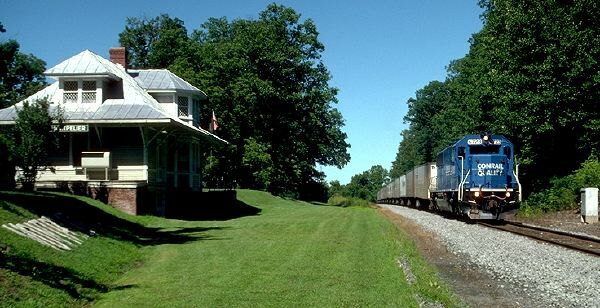 There are extant stations on the ex-Southern line at Culpeper, Orange, Montpelier, Charlottesville, Oak Ridge, Arrington, Amherst and Lynchburg (Kemper St.) The stations at Montpelier and Oak Ridge were essentially private stations built to serve adjacent estates. The line is a mixture of single and double track CTC. Dispatchers will usually announce meets at the end of double track segments. There are several high/wide and hot box detectors along the route that announce the presence of trains. 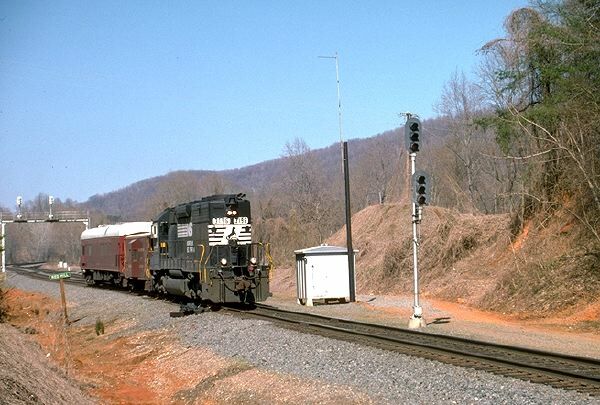 Signals are Southern-style three color lights, mounted on bridges in double-track territory. Most signals are continuously lit. The line is accessible over much of its length from parallel roads, overpasses and grade crossings. 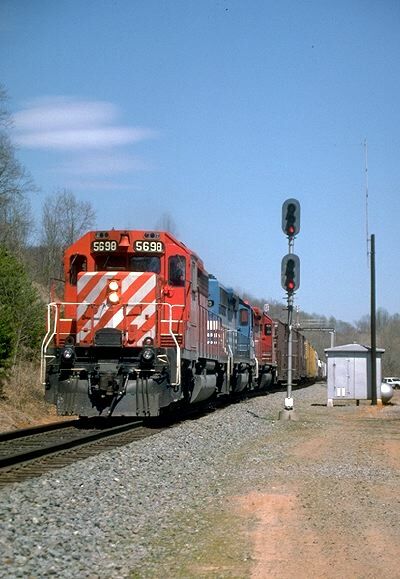 There are often as many as ten intermodal trains scheduled through Charlottesville daily. At least four manifest trains run daily. Occasional grain and coal trains are also seen; they carry a 600-series symbol. Grain trains run to the Cargill elevator in Culpeper. Coal trains operate to the Pepco power plant in Alexandria. Many trains on the ex-Southern main head west at Manassas to travel along the "Branch" or "B-Line" to Riverton Jct., where they head north to Conrail in Hagerstown, Md. 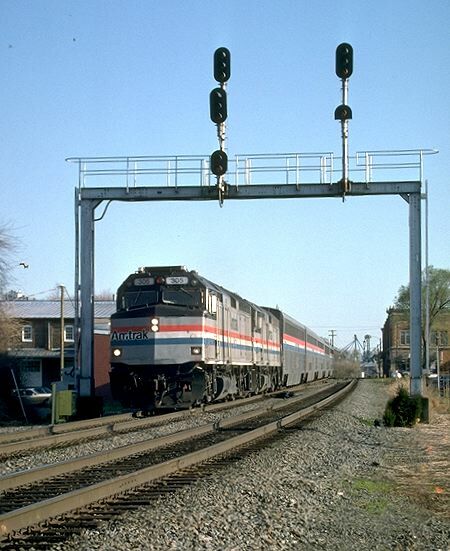 Amtrak trains 19 and 20 also run daily, stopping in Lynchburg, Charlottesville and for a flag stop in Culpeper. Amtrak 50/51 travel north of Orange on the NS, stopping at Culpeper. Below are symbols for trains normally seen on this section of the Piedmont Division. See explanatory notes below for additional trains that may appear. 155 Manifest Hagerstown Birmingham Daily From CR in Hagerstown. 204 COFC/TOFC Atlanta Alexandria, Tues-Sat Runs as I04 on Sun. (East Point) Mon-Thurs Roadrailer, from CR, runs with CR power. Runs as I65 on Sat. (East Point) Hagerstown Mon-Thurs Roadrailer, to CR, runs with CR power. Runs as 244 on Sat. 456 Manifest Roanoke Hagerstown Daily To CR in Hagerstown. 457 Manifest Hagerstown Roanoke Daily From CR in Hagerstown. Extra sections of 100 & 400 series trains carry an "M" designation. Extra sections of 300 series train carry a "W" symbol. as I03 which runs on Saturdays. Extra sections of 300 series trains carry an "X" prefix. Amtrak passenger extras carry an "R" symbol. Work trains and light engine moves have 900 series symbols. Dispatcher-controlled radio transmitters are in service at the following locations. Dispatchers will often announce which radio they are answering. Dispatchers will often talk on Channel 2 when Channel 1 traffic is heavy. (1) Orange: Amtrak's Cardinal leaves CSX rails and passes underneath the southward signal. 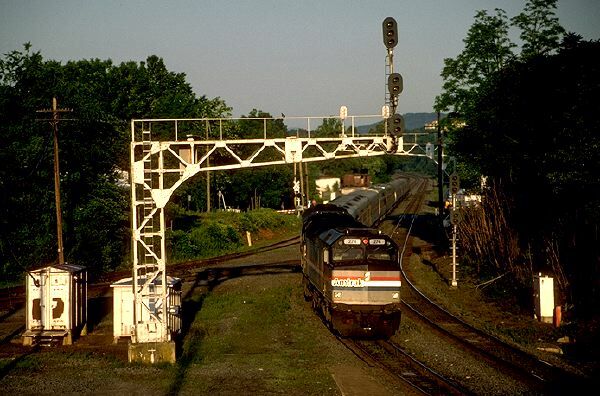 (2) Montpelier: NS 265 passing the historic station at Montpelier. CR 6723 on the point. August 1997. (3) Weyburn: NS C39-8 #8569 leads NS train 228 south through Weyburn, Va. 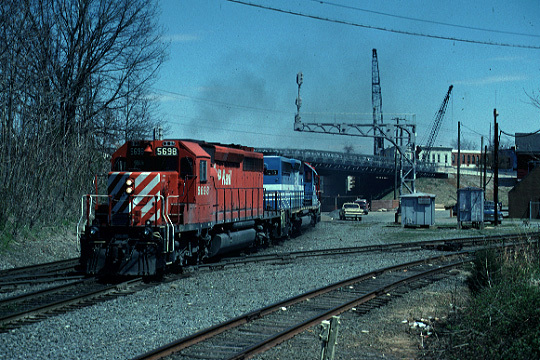 This double-stack service runs via Hagerstown and the W&LE on its Detroit to Norfolk run. February 1997. 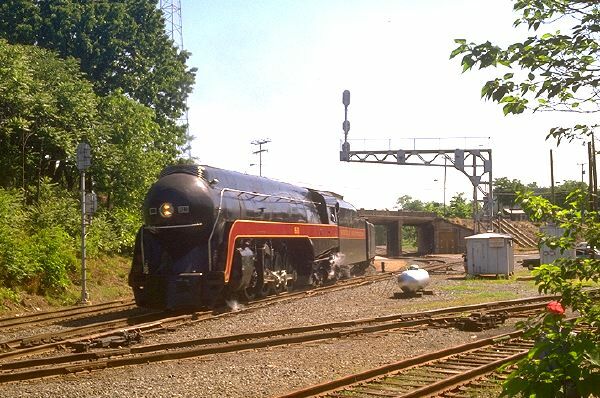 (4) Charlottesville: N&W 611 approaches the C&O diamonds on an Alexandria to Lynchburg excursion, 1993. 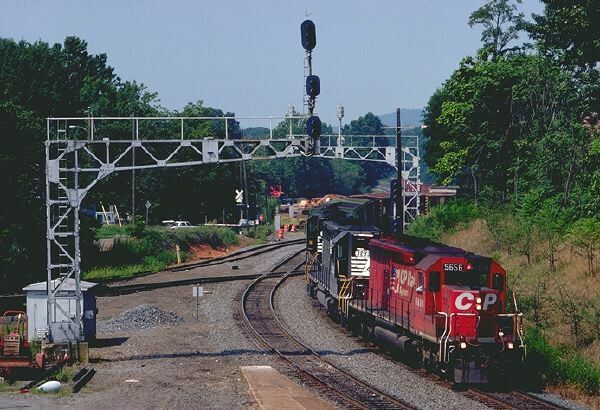 (5) Charlottesville: NS 341, led by CP SD40-2 #5698, crosses the CSX diamonds. Run-through CP power on the point. (6) Charlottesville: CP SD40-2 5656 leads NS 342 across the CSX diamonds on #2 track. Note the shoofly in the background. August 1997. 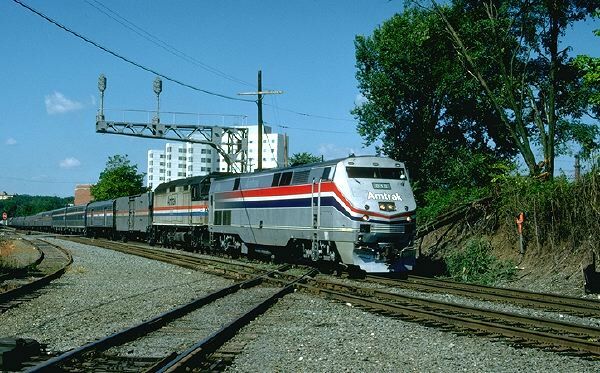 (7) Charlottesville: Amtrak #20 eases to a stop on a mid-summer morning. 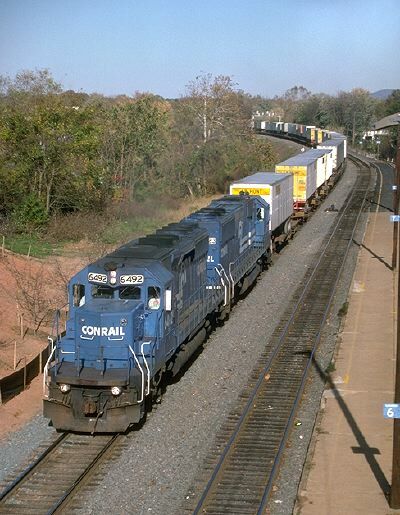 (8) Charlottesville: Conrail 6181 on the point of NS 213 as it passes the site of the new 10th St. underpass. 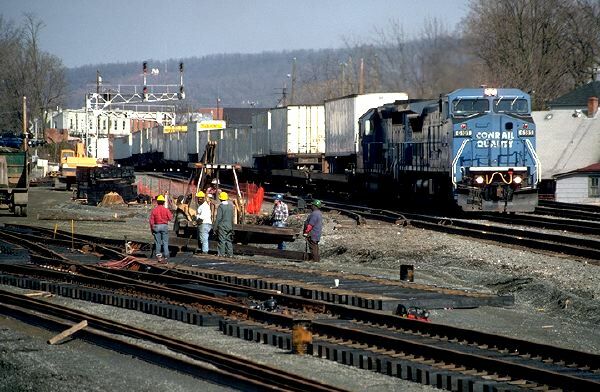 Workmen in the foreground are constructing the shoo-fly trackage which will divert trains around the work site. March 1997. 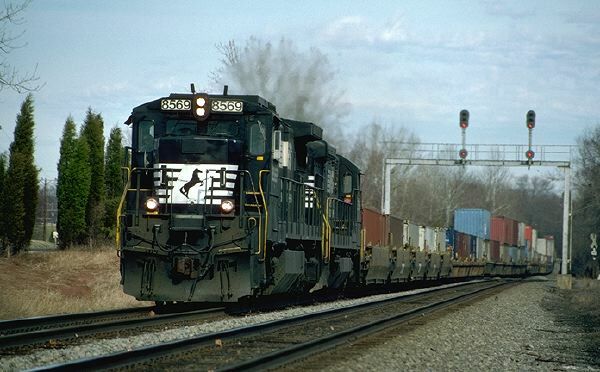 (9) Charlottesville: NS 213, led by a Conrail SD40-2, passes the American Orient Express. The latter train is waiting while its passengers tour Monticello. April 1996. (10) Charlottesville: Amtrak #20, the Crescent, deadheading without passengers and running five hours late in the wake of Hurrican Fran. 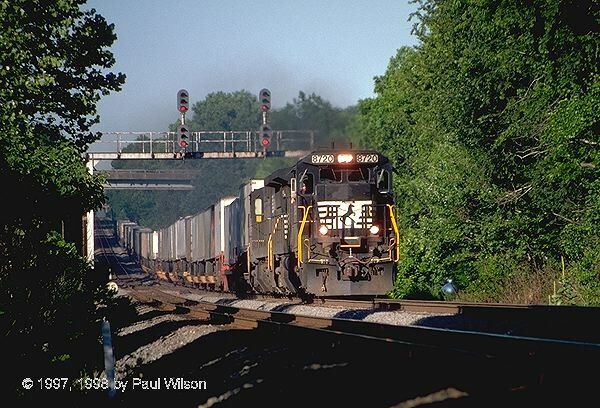 (11) Charlottesville: NS213 brings a full load of containers and trailers through town. October 1996. (12) Teel:NS 203 passes the crossovers at Teel on #1 track. NS C40-8 8720 on the point. August 1997. (13) Teel: NS 341 accelerates out of the sag at Teel, headed by CP SD40-2 5555. February 1998. 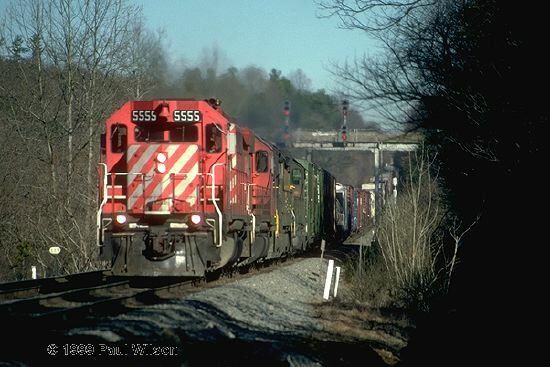 (14) Red Hill: NS 341 with run-through CP SD40-2 #5698 leads NS 341, April 1996. 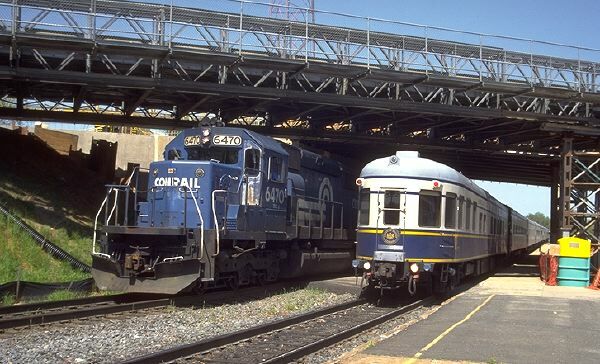 (15) Red Hill: NS geometry train heads south, April 1996. 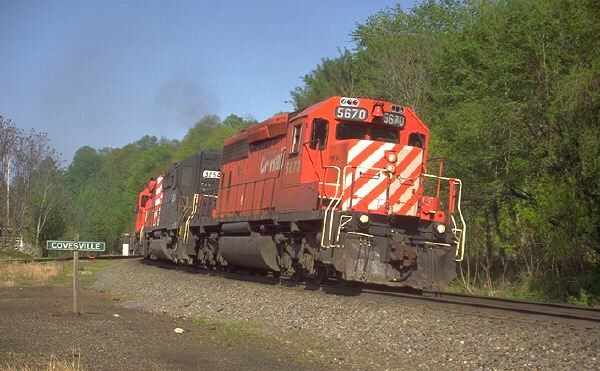 (16) Covesville: NS 341 with run-through CP SD40-2 #5670, April 1996. Page maintained by Paul A. Wilson/pawilson@starpower.net. Your comments are welcome. A special thanks to Vic Stone for his assistance with this page. Copyright � 1996-2000 by Paul A. Wilson. All rights reserved.